81/250 is part of the 2016 Super Treasure Hunt and 1/10 in the Night Burnerz series. It has reddish purple Spectraflame paint with a black & white stripe on the top. 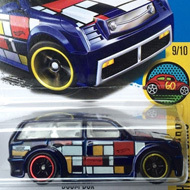 The hood and sides have the Yokohama logo and the trunk has “TH” and the Hot Wheels logo. 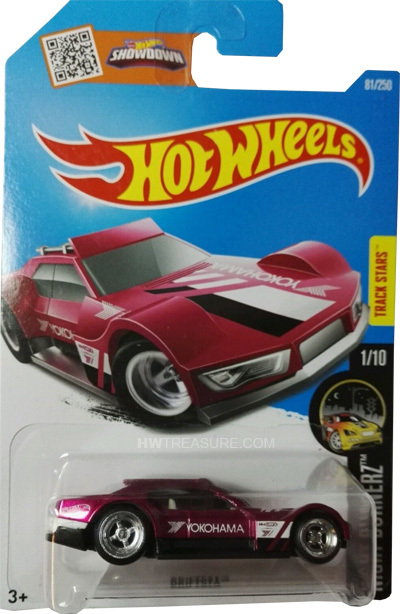 The sides also have the Hot Wheels logo as well as “HWGRFX”. 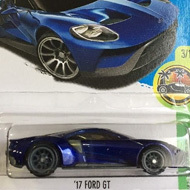 The car has blue tinted windows, a gray interior, Real Rider wheels, and a white plastic Malaysia base. The Driftsta made its debut in the 2015 HW Workshop – HW Drift Race series. It is a unique design of a wide body drift car.